This elegant 4 bedroom, 4 bathroom townhouse is nestled in wooded seclusion against the backdrop of the High Peaks. Located on Old Military Rd, near the Olympic Ski Jumps and the Horse Show Grounds, you are 3-4 minutes from downtown Lake Placid and ten miles from Whiteface Mountain. 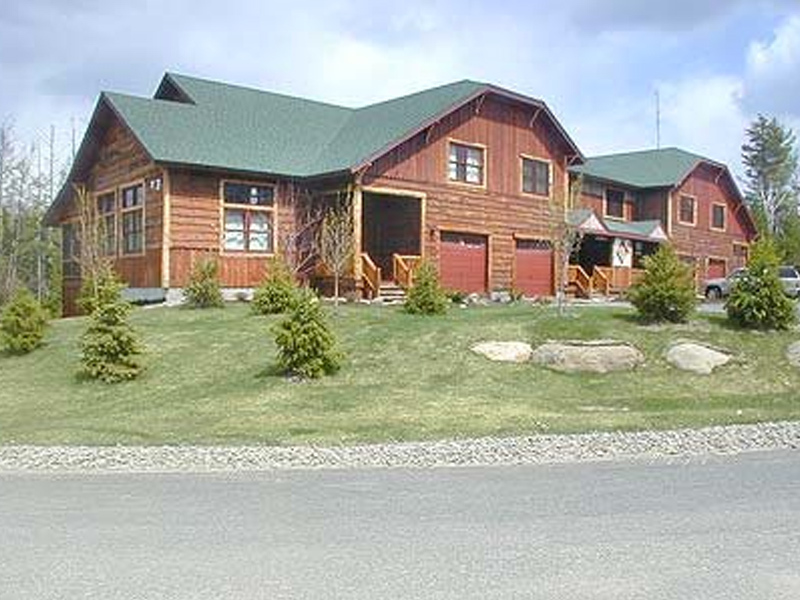 Golfing, tennis, hiking, water sports, skiing, and fishing are nearby. The Balsams is brimming with inviting Adirondack ambience. Two floors of living space, plus a basement can comfortably accommodate 8 people. This luxury townhouse includes hardwood floors, cathedral ceilings, granite countertops, stone fireplace, and radiant heated tiled bathroom floors. French doors lead to the rustic outdoor deck. Expansive double wide windows bring the natural outdoor setting and the spectacular views of the High Peaks indoors. Adirondack décor, including rustic Aspen log beds, is found throughout. After a day of enjoying the many activities available in the heart of the Adirondacks, eat in the fully equipped hickory kitchen, snuggle next to the gas stone fireplace in the Great Room or relax in one of the two Jacuzzi tubs. Wireless Internet available throughout townhouse. Two bedroom-bath suites are found upstairs; one with a king-size bed and the second with two twin beds. A third bedroom with a king-size bed and bathroom in the hallway is located on the first floor. The lower level has a fourth bedroom with a queen size bed, laundry room, full bath, plasma TV/DVD and sofa sleeper in the den/game room. The loft overlooking the Great Room contains a full size futon which can double as a bed. Linens included. No pets allowed, Smoke-free house.